This song won't stop the world but it might stop you." "Can we make a difference in a world that's upside down? Can we make a difference and help turn people around? Can we make a difference when wrong can't be told from right? Can we make a difference and help people to the light?" Over the next few decades, Warwick kept writing songs and playing music, all the while endeavouring to keep the dream of making a difference in the world. In 1989 while working in the building industry, he registered Australian Heart Music as a vehicle for himself and other musicians to express their love for God and their hope for a better world. He recorded several albums, and in 1990 left full time employment to bring his dream into reality. Warwick and his family have traveled across Australia playing music and sharing the dream with people. Mostly the poor and forgotten, Aboriginal communities, remote outback towns, schools, churches, gaols and isolated communities. 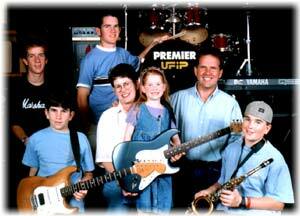 Since 1990, Warwick and his family continued to travel, share the good news, give free concerts and help people. Their travels have now included Uganda, Kenya, South Africa, China, Philippines, Indonesia, Thailand, and many other countries of the world. All this time doing what they can, where they can, to make a difference. Coming back from a world tour which included Africa, Warwick was challenged with the poverty in the world and the need for answers at every level; physically, emotionally and spiritually. In 1999, he wrote out his vision to help a billion people by raising a million dollars. The help would come by empowering people through educational and inspirational multi media. The long-term vision is to turn the first million into one hundred million by multiplication through people and strategic fund raising over the next ten years. Australian Heart Ministries has been in operation for over ten years, but has only recently officially incorporated. For many years, Warwick, his family and friends have lived below the official poverty line, but at the same time have been able to travel to many countries and help many people. Many more people are catching the vision. Others are volunteering to help. Companies like Apple computers are supporting Australian Heart Ministries in their dream to make a difference in the world. Will you partner with us to help people around the world at every level? You can make a difference!